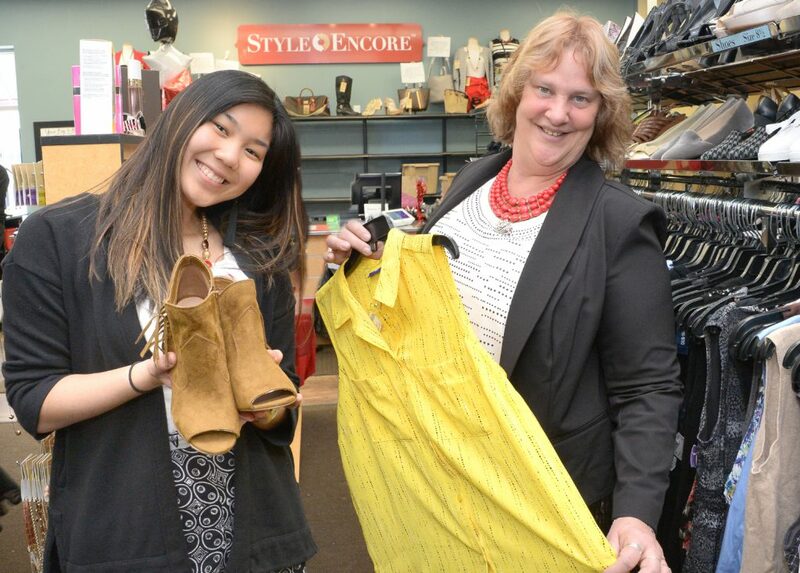 Rhonda McMaster-Allendorf, right, owner of Style Encore, with employee Megan Utama. Rhonda McMaster-Allendorf said her new shop in Clifton Park can please a fashionista, or a professional looking to build a work wardrobe. Style Encore, located in Clifton Park Center, offers lightly used second-hand items at an affordable price. “We just opened and already I can say so far, so good,” said McMaster-Allendorf. Style Encore is a women’s apparel franchise that buys and sells used clothing, shoes, handbags and accessories. Apparel sizes run from extra small to 6X. McMaster-Allendorf said she and her daughter, Mehgan McMaster, decided to open the business after gaining experience working with Plato’s Closet, a similar type of store. Style Encore, McMaster-Allendorf said, specializes in high-end brands that women are often in search of, including brands like Louis Vuitton, Ann Taylor, Nine West, Talbots, and Michael Kors. “There are alot of professional women in the Clifton Park area, and we have what they are looking for,” said McMaster-Allendorf. She said anyone looking to sell clothes can bring them in freshly laundered and not on hangers. She puts them in a database, checking for style and condition. Once they are able to gather all the information needed, they offer the seller a price. If the seller accepts it, they are paid. The process encourages people to clean out closets and simplify their lives by getting rid of what they no longer want or need, a trend that many people are participating in, McMaster-Allendorf said. With stores like Style Encore, shoppers are able to see the process up close, with sellers receiving money immediately and buyers being to able to try pieces on and see the quality up close. Style Encore, Plato’s Closet, Once Upon A Child, Music Go Round and Play It Again Sports are all franchises specializing in second-hand products and all owned by the Winmark Corp. Style Encore has between 15 and 20 employees. She expects to see a steady flow of customers year-round, since they sell clothing for all seasons. Style Encore is located at 22 Clifton County Road, #78, Clifton Park. They are open Monday through Saturday from 10 a.m. to 9 p.m., and Sundays from noon to 6 p.m. They can be reached at 518-630-5730 or online at style-encore cliftonpark.com.